Last week was one of my best and a good one for democracy as I had the opportunity of participating in a Monitoring and Evaluation (M&E) training organized by Cloneshouse Nigeria. Pre this training, I had a contracted knowledge of the M&E process (also referred in this piece as The Process) albeit I was quite aware that its skills are amongst the most requested of, in the non-profit development space. The only thing I could remember on M&E was one of my International Economics professor’s comments that inadequate M&E frameworks are one of the problems facing governance in Africa. As someone passionate about knowledge, outstandingly so when it concerns development, my interest and expectations from the training were hyper-raised. What I did immediately was to seek permission from my boss to attend the training and scan through most of my Masters’ education briefs in International Economic Policy Analysis to probably get a deeper insight into what The Process was all about. I also went online, trying to have a briefing about the theme. Summary of what I picked was that The Process is a key component of policy processes and comes timely in improving and assessing performance of programs, projects, institutions and policies. The first day of the 8-day training proved to me that I was in the right place. 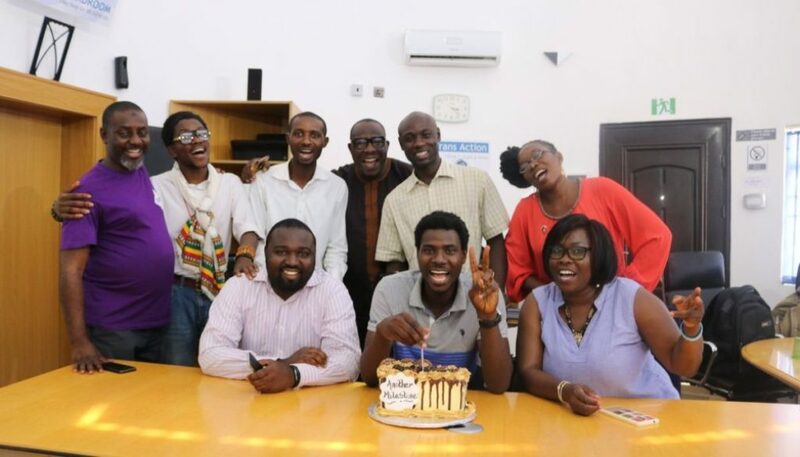 It was held at the Boardroom, on Ganges Street, Maitama, Abuja, and in participation were 9 colleagues in the development space from the British Council’s Nigeria Stability and Reconciliation Programme and PACT Nigeria. The training started by introducing The Process and accentuating its very importance in the implementation of projects. ‘The essence of M&E is to achieve results in programs implementation and for measuring the extent and impacts of open government, open governance etc. in project implementation,’ said Oludotun Babayemi, one of the facilitators. So, The Process is for enhancing topical and future management of outputs, outcomes and impact of a program. The monitoring component of The Process helps in tracking the program activities so as to adjust deficiencies, while the evaluation component helps to assess the program’s performance after 2 – 5 years of its implementation. From these were further lectures on the 12 components of an M&E system. According to Oludotun, ‘this is the engine of The process.’ The components encompasses organizational structure for M&E system, human capacity building of M&E staffers, carrying all relevant stakeholder partnerships necessary, communicating processes and performance of the program to relevant stakeholders, M&E plan, costed work plan, routine monitoring to improve performance, periodic surveys, data auditing, database system, evaluation and research, and using information to improve results. What caught my attention was the configuration of an M&E plan which has the logical framework, data source matrix, budget, information product matrix, information dissemination matrix, managing partnerships between stakeholders and when the M&E system and plan will be reviewed. The logical framework, which remains one of the most important component of the M&E plan and process interested me the most, as it contains the result chain [inputs, activities, outputs (routine monitoring), outcomes and impact (evaluation)]. All of the result chain elements have indicators for measuring them. These indicators have baseline (situation before program implementation accessed during baseline assessment) and targets (quantifiable goals of the different components of the result chain – what the program intends to achieve at each stage). Data collection for periodic monitoring, surveys and evaluation are exceedingly vital in The Process as it presents the sources of data, publication dates, who does what, budget for the data collection or access and methodology of data collection etc. In addition were exposures to monitoring information system, logical framework, checklist for evaluation planning etc. From this were lectures on the data collection and analysis component of evaluation in M&E – how programs are evaluated. Google forms were used to simplify the preparation of data collection tools, electronic data collection, and it automatically gathers data and input in a database (Google Spreadsheet). The Spreadsheet was so handy for data analysis. We were also exposed to the Kobo tool box for mobile data collection. Microsoft Excel was also used for data analysis. Altogether, as someone that has been battling with using Statistical Package for the Social Sciences for elementary data analysis, the applications/software helped to demystify data analysis. At the end of the training, I presented an M&E plan for a pseudo program. The plan was for an international nonprofit 2 year program which intends to improve literacy rate in a certain Shikira community from 25% in 2017 to 35% in 2019 through improving primary school enrollment in the community and improving teachers knowledge and teaching skills. The community, with a population of 1,000 with 60% being under 14 children has one of the poorest literacy rates in a State with poor primary school enrollment rate, inadequate number of classrooms and teaching equipment, and lack of skilled teachers. Please find the M&E plan/assignment here. The plan was supposed to make sure the results and objectives of the program were achieved. This was a phenomenal training and wonderful exposure to M&E for me. Having stated that I started the training with no single knowledge of The Process, I am still surprised about how fast I learnt and how meaningful and interesting the training was. Perhaps, the expansive knowledge of the facilitators, their quality teaching skills and the various M&E System templates used and shared guaranteed this. This was so beautiful to me and I look forward to having the knowledge gained become relevant as I move forward career wise and academically. As someone passionate about economic development and interested in the development sector, I was really impressed. This was beautiful. This was SUPER. M&E really interests me and remains one of the best initiatives or processes in the development sector. I think M&E training is necessary for everyone in the development space, both in public and nonprofit organizations. Organizations also have to send their staffers for such training. The dynamics of the training are expansive and cuts across the normative operations of organizations. For human capacity building, monitoring and evaluating performance and achieving results in programs and projects, as well as for enhanced organizational productivity, such training is exceedingly important. Beyond Amnesty International Reports: Civil – Military Relationship in Nigeria	FOI ACT IN NIGERIA: WORKING OR NOT?